We have eight students, but with ten 14.2’s and two 420’s we could have 24 students! We meet every Tuesday 2 ½ hours 4:00 – 6:30 PM. 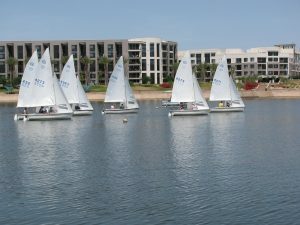 Training to sail and race is taught by US Sailing certified instructors. There is a safety boat on the water at all times. 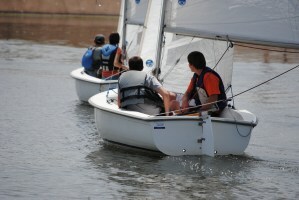 Beginning students usually sail with an instructor on board the first few times. 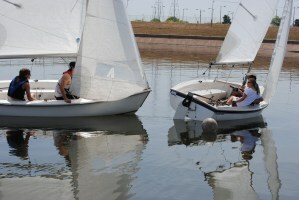 The objective of the class is to have fun on the water. More details on the AYC education page web site. Once a year there is an Arizona High School double handed championship. A perpetual trophy is to be displayed at the winner’s school until the next year. 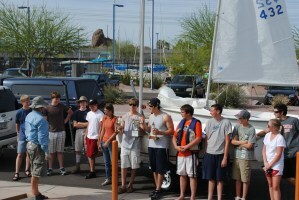 Individual trophies are given to the skipper and crew. 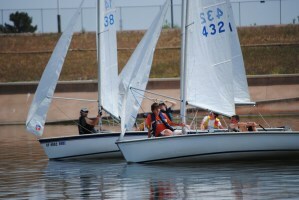 Skippers must be 9-12 grade level; crew can be from Jr. High School. This year the race will be in the east basin of Tempe Town Lake on Saturday April 16th. And the boats will again be Capri 14.2’s. The race NOI and SI will be available in Mar-11. Pictures from last year below.